At Capps Pizzeria, we pride ourselves on our expertly crafted, wood-fired, non-traditional take on Neapolitan style pizzas. But, it's the local, farm-to-table nature of what we do that makes everything we serve so special— right down to dessert. To our Customers: Our foremost mission is to ensure that you enjoy your food. The most satisfied guests are those who know what to expect. If you are new to Neapolitan-style pizza, please give us a moment to explain. 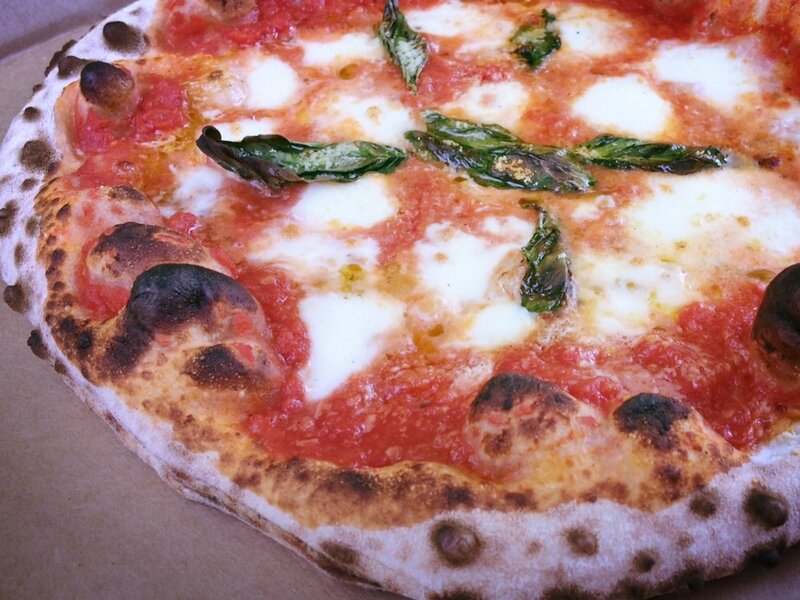 Neapolitan pizza is a “new” concept to many, but it is far from new. It is the pizza that was made—and continues to be made—in Naples, Italy, the birthplace of pizza. Neapolitan pies are crisp, light, and sparsely topped. They are about the size of a dinner plate. This is the way that pizza was made before it was “Americanized” and in many cases debased. The Size: All of our pizzas are a generous 12 inches. They are meant to serve one person. The Look: “My pizza is burned” is something we sometimes hear. These pocks of char are called “leopard spots.” They are the measure of a correctly cooked pizza and lend both flavor and texture. Being hand crafted, Neapolitan pies may be irregularly shaped. The Toppings: Neapolitan pizzas have less sauce than American pizzas and a lighter sprinkling of cheese. Less is more: a light, fresh pizza with a few highest quality ingredients is easily digested and will not leave you feeling bloated or carb-overdosed. The Texture: The crust is light and crisp on the outside and soft and tender on the inside with a puffy and blistered cornice. The balance of crispiness and chewiness is the essence of the Neapolitan pie. The Taste: Tomato sauce must taste like tomatoes and nothing else. 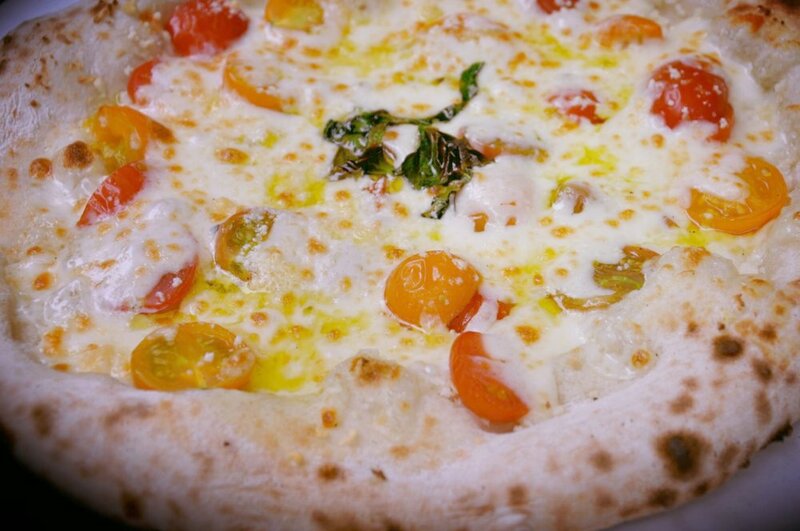 The basic cheese is high quality fior de latte—better known as “fresh mozzarella.” There is a slight kiss of smoke from the wood-burning oven. 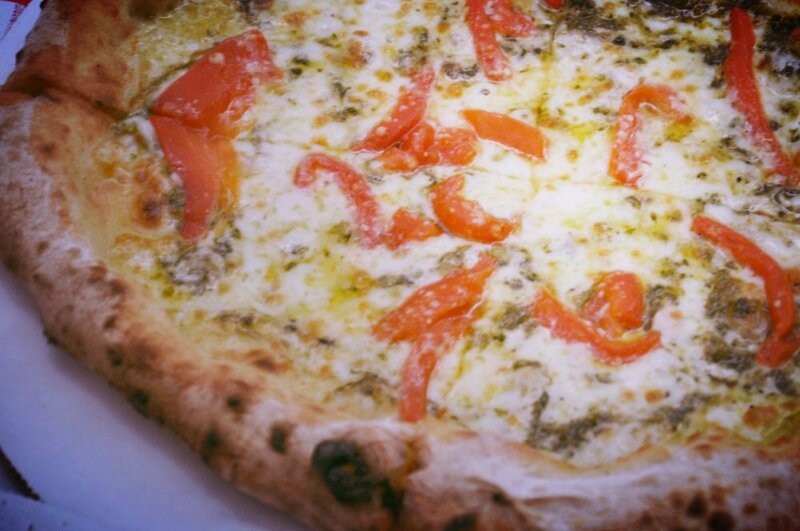 The combination of smoke, cheese, tomato, olive oil, and basil lends the quintessential Neapolitan taste. Our Ingredients: We source the best ingredients we can find and if we can make it or grow it better, we do. Our sausage and meatballs are house-made. Our pizza dough includes flour ground in-house. *To-Go pie orders can take anywhere from 15 minutes to 60+ minutes, depending on orders ahead of yours.